My buddy, Paul Valle of Oakdale, Minnesota, had called me a couple of days earlier to see if I wanted to go fishing. “We’ll take my boat,” he tells me. 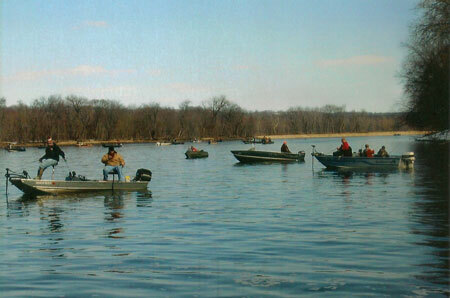 It is mid-March and we will fish just below the dam on the Mississippi River, north of Red Wing, Minnesota. As far as I am concerned, the first time I am in a boat on open water is the beginning of spring. Although we both are old enough that we are drawing Social Security, we are as excited as boys as we motor to the dam. Paul confesses it has been a couple of years since he last had his boat out. We have great enthusiasm for the day, but after several hours we have only one fish, a 19-inch walleye Paul caught. I don’t think I had had a strike. This could be discouraging, but it is spring now and we are fishing for the first time this year in a boat, so neither of us finds it even the least bit depressing. The opposite is true. It is good to be back on open water again and the weather is fairly tolerable. Paul and I have fished through some miserable weather, including an ice storm in the early days of the season. So, we are just enjoying the day and the weather, regardless if the fish are biting or not. Suddenly, Paul pulls up on his spinning rod to set the hook. It is doubled over and line is coming off his reel. I bring in my line, dropping the rod to pick up the net. I wait as Paul fights the fish and then we finally see it in the murky water. It is a long shadow. I extend the net out as Paul leads the fish into it and I pull up on the net. A huge walleye sags into the mesh. It is 29 inches long and full of spawn. We guess the fish has to be ten pounds. Paul says it is the biggest walleye he has ever caught. I take a quick photo of it before Paul slides it back in the water. It is a heck of way to start the season. In the middle of March, there are fishermen still fishing through the ice in northern Wisconsin. But not me. I am on the Mississippi River and it is the beginning of the first fishing season for me, lasting until the beginning of the bass and walleye season on the first Saturday in May. I know many people are asking, “What about ice fishing?” I look at ice fishing as something to do between the end of the open water fishing on the Mississippi River in the fall until I can get back on open water in March. I used to be a big ice fisherman when I was younger, but now I only do two ice fishing trips each winter; one to Red Lake in northern Minnesota in the middle of January and the other to Lake of the Woods on the Minnesota Canadian border at the end of February. Essentially, winter for me is just waiting until I can get the boat back out on the river. In early spring, the weather can be tough with snowstorms, ice and freezing temperatures. As spring progresses, the weather turns milder and is usually fairly comfortable by the time the regular fishing season starts. When fishing the Mississippi River early in the season, I dress like I am going ice fishing and over the years I have bought special clothing just for fishing the river early in the spring or late in the fall. A week after my fishing trip with Paul, I wake to find two inches of snow on the ground, wet and slushy. I head back to the river with Dennis Virden, of Burnsville, Minnesota. When we get to the landing, I find slush had splashed up in the boat and was now frozen on the bow, trolling motor, windshield, console, tackle bag and outboard motor. As we motor upriver, we see a tree trunk sticking out of the water like a hand coming up, covered in snow. Snow clings to all the tree limbs and covers the ground. It is not nearly as cold as we expected, but still chilly with light winds. I get the first sauger. Too small to keep, but a start nonetheless. The wind picks up and it feels colder. We move and try again. Nothing. Finally, we move closer to the bank where I find an eddy in about 28 feet of water. Shortly after we drop anchor I get another sauger. This one is a keeper and it goes into the livewell. I pick up two more sauger, but the fishing is slow in the snow. Dennis yells he has a fish and then adds that it is a “big fish.” The fish races off, peeling line off the reel. The fish stops and Dennis tries to regain some line but the fish takes off again. This seesaw battle continues. I have the net ready. Dennis gets some line back and then the fish takes off again. The fish stays deep, making long, muscular runs. Finally, it gets closer and then we see a long, prehistoric looking silhouette in the stained water. It is a big sturgeon! It still takes awhile before Dennis gets the fish close to the boat for me to net it. I grab the net with both hands to pull it in the boat. We measure the fish before we take photos and release it. It is 41 inches long. We might not have caught many fish today, but the sturgeon sure makes up for it! This spring is an anomaly. Normally, the river is high, many times overflowing banks and causing flooding. There have been a couple of years when the flooding was so bad the river was shut down to all boat traffic. Now the water is a bit higher than normal, but not nearly as high as we have seen in other years. The water is dirty from runoff with a strong current, as we expect in spring, but not anywhere near flooding. All that can change with late season blizzards or a couple days of steady rains, but for now the river seems unusually stable for spring. Spring is a time of rebirth for the waters and land. Fish are spawning, providing another generation of fish. We see skies filling with birds. We hear yelping of snow geese and guttural honking of Canadian geese as they head north. We see strings of pelicans flying north as well. Eagles flock to the river. They float on the current of the wind overhead, occasionally dropping into the river to grab a fish. We hear them chattering to each other in the trees and sometimes we see half a dozen or more eagles sitting majestic and regal in one tree. Their white heads and tail feathers contrast sharply against the barren trees and the dirty gray or bright blue skies. In early April, Doug Hurd of Eagan, Minnesota and his grandson, Drake Castaneda, and I motored upriver to the dam. It was warm and sunny. Although the water was still a bit above normal, the current remained strong. We were fishing deeper water that day. It was tough to get our ¾ oz. jigs to the bottom without the current sweeping them away. We thought we had the anchor set. We were fishing about twenty minutes when a gust of wind blew Drake’s hat off, riding the current downriver. As Doug pulled the anchor and I started the engine to race after his hat, Drake pulled up on his spinning rod and it was bouncing as a fish pulled back. Doug grabbed the net and a moment later netted a walleye. We measure it and it is too small to keep so we released it. We finally raced after Drake’s hat, scooping it out of the water. We tried two or three times to get the anchor to hold but were unsuccessful. The anchor kept dragging. Finally, I pulled into a deep hole of about 25 feet of water only a couple of boat lengths from the rocky bank and the anchor finally held. When it comes to walleye fishing, minor adjustments in bait color, depth, or boat position can mean a difference. We were hoping this would be the case in this spot since the boat was holding so well. We had lunch and halfway through my sandwich I felt a strike. I dropped the sandwich as I set the hook. The fish put up a good fight but when I get it in the boat, I see it is a mooneye. A lot of folks consider them trash fish, but they put up a good fight and are fun to catch. Shortly thereafter, Drake caught a white bass. It seemed a little early to see white bass. A few minutes later, I get a sharp hit and when setting the hook, it feels like a good fish. Drake scrambles for the net while I get the fish in. It turns out to be 17-inch walleye. I checked to see if it is female and if it was I would release it since she would be full of spawn, but it is a male and goes into the livewell. 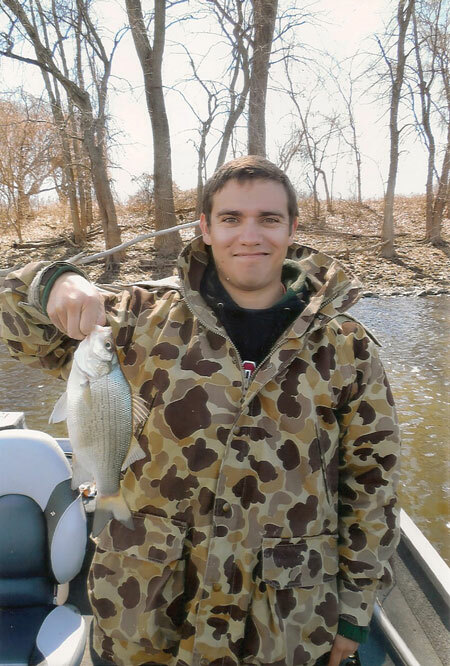 By the end of the day, our faces are red from the sun and wind but we caught about two dozen fish, keeping seven, two walleyes and five sauger. Although there are several areas on the Mississippi River north of Red Wing, Minnesota to fish, I normally fish just below the lock and dam several miles north of Red Wing. The lock is on the Minnesota side of the river and the dam is on the Wisconsin side of the river. Between the lock and the dam there is a rocky island. I do not know if the island was always there, or if perhaps the island was man-made while building the dam. I fish the dam side of the river. The current draws fish, but can have its drawbacks if it is too strong to either anchor your boat or get your bait to the bottom. If the current is too strong on the dam side, then I move to the lock side where the current is much slower. However, the fishing is also much slower on the lock side. The secret to walleye fishing, no matter where you fish, but certainly on the Mississippi River, is to find what depth the fish are at. Since they hug the bottom, it’s important to get and keep your bait there. With the heavy current and high waters usually found in the spring, keeping your bait on the bottom can be a challenge. Many times, where the current is at its strongest, you seldom find bait fish. They just can’t withstand the current. Over the years, I find fishing close to shore works well. The current is not nearly as strong as in the middle of the river, so bait fish will be found there, which attracts bigger fish. It is also easier for our baits to maintain contact with bottom. The weathermen on television said to expect rain and a couple of days later as I pulled out of my driveway with Doug and Scott Clark, of Hudson, Wisconsin, a light drizzle of rain splattered on the windshield. Motoring upriver to the dam, we anchored in 25 feet of water, about three boat lengths from the rocky bank. Temperatures were in the low 50s and the rain we expected had blown out, leaving light gray clouds, laced with blue skies. Strong winds made it seem colder than it actually was. It didn’t take long to get the first strike. It was a small walleye that we released. Finally, I felt a harder tap on my line and when setting the hook, felt greater resistance. I pulled in a keeper sauger, which went into the livewell. From there we steadily got strikes. It was early afternoon when Doug pulled up on his spinning rod and it was bent in half as a fish raced off. Scott dropped his spinning rod to grab the net and a couple of moments later Doug led an 18-inch sauger into the net. It was the biggest fish of the day. Doug reached in, grabbed the fish and pulled it out, but as he did so, we saw it oozing spawn. Doug twisted the hook out, slipping the fish back into the water. Bigger fish full of spawn, like the one Doug caught, are the future of fishing. They need to be released. There are enough smaller fish to keep for eating. Let the breeders live to eventually replenish the fish we keep today. By the end of the day, we caught about half a dozen bigger fish, all full of spawn, which we released. Late afternoon I felt a hard hit on my bait, and when I set the hook, I felt a solid weight as the fish took off. I turned the fish, but it kept pulling away, line slicing through the water as it darted off. It felt like a good fish and I yelled for the net. Scott grabbed the net about the time I saw the fish. The flat profile and silvery color identified it as a white bass and I told Scott I guess I didn’t need the net after all. As he dropped the net, he felt a tap and set the hook on a fish as it too raced away. 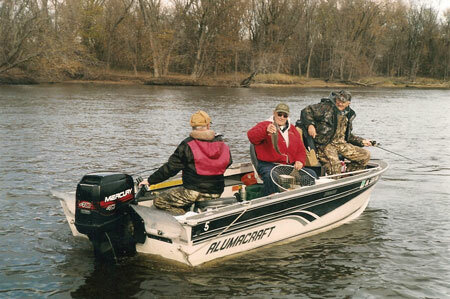 By the time I hoisted my fish into the boat, Doug was netting Scott’s fish, a keeper sauger. Another hour later we headed back to the landing. We had 11 fish in the livewell, and with the smaller fish, white bass and the bigger breeding stock, we guessed we released and caught over fifty fish. There are any number of baits which work well for spring walleye fishing. Probably the most popular is simply a jig with a minnow. I use heavy jigs, normally at least ¾ oz. or sometimes a full ounce, so I can get the bait to the bottom. Color is simple. Anything with chartreuse works well. If that color doesn’t work, then I switch to gold. One of those two will always work. My favorite bait for river fishing is a modification of the old Wolf River Rig. Tied on to a 3-way swivel, I have a foot long leader tied to a heavy jig and another foot and a half long leader tied to a plain hook with three chartreuse beads. Again, chartreuse is the key color. Especially in the spring when the current can make it tough to fish, another productive bait is a simple bait rig. I use a 3-foot long leader with either a single hook and three chartreuse beads or a Gum-Drop floating jig by Northland. The leader is attached to a swivel. On the swivel, I attach a bell shaped sinker. Generally, I use this rig when my 1 oz. jig isn’t getting to the bottom. I start with a 1½ oz. to 1¾ oz. sinker. If the rig is still not getting to the bottom, then I add more weight. Once I get to three ounces, I stop and find a different place to fish, because that means the current is too strong for either bait fish or game fish to hold in such fast water. It was late April and the regular fishing season was less than a week away. Scott called, asking if I would be interested in going fishing tomorrow. I told him I didn’t think so since I had some stories for Badger Sportsman to work on. After I hang up, my wife Becky said, “Go fishing. The weather is suppose to be beautiful, can’t you get your stories done later?” I thought about it for a moment, and she was right. I had a chance to go fishing, so why not take it. I called Scott back telling him he is a bad influence on my work ethic and I can go fishing. Scott laughed, telling me he will see me in the morning. There are light blue skies with no clouds and almost no wind. There are not many fishermen on the water today. As we motor up to the dam, I see two bald eagles perched side by side on a branch. It makes me think of a husband and wife sitting together. We drop anchor and in the next half an hour we catch five different fish; a sheepshead, white bass, walleye, sauger and a mooneye. We catch a lot of sheepshead, putting up a good fight, which is what fishing is all about anyway. I catch a white bass, which is one of the bigger ones I’ve seen. It was at least three pounds. We pick up the anchor and drift with jigs and minnows, catching a couple of fish. We work back along the bank, flipping blade spoons toward the shore. We are hoping to find white bass. They should be here this time of year, but we haven’t seen them yet in the numbers we normally expect. I flip my spoon against the rocky bank and about halfway back get a solid strike. The fish is fighting hard and I wonder what I have. As I get it closer, I see it is a 3-pound largemouth bass. The first of the year. It felt good to catch it and as I release it, I hope it is a good omen for the bass season starting soon. We go back to our original spot and anchor again. We are almost out of minnows by the time we head back to the landing. We again caught about 50 fish. It has been a good day of fishing and my last day on the river for spring. In another five days, the bass season opens. It has been good fishing, with lots of great fishing buddies and fun times this early season. A new fishing season awaits me. I am looking forward to it, but I will be back on the Mississippi River in late fall for the last open water fishing of the year. For more articles like this one – click here!